Keeping promises made at a meeting Friday where community members, business owners and others expressed concerns about the record late-summer spike in crime including street robberies concentrated around Pike/Pine, Seattle Police Chief Kathleen O’Toole oversaw this weekend as SPD gang units were deployed to Capitol Hill’s core. 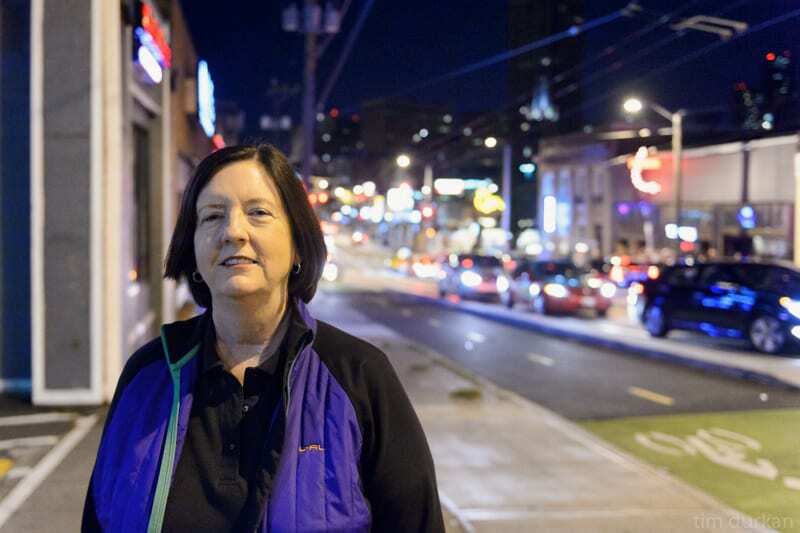 The recently-sworn-in chief who vowed to “work tirelessly on behalf of Seattle” when her selection was announced in May was seen out on the Hill’s streets with a badge herself Sunday morning near the heart of a roaring nightlife scene. CHS caught up with O’Toole on Broadway between Pike and Pine — where at the time an apparent suspect was being talked to by several officers behind the building that houses Moti Mahal — at about 12:45 AM. O’Toole talked to CHS about crime and arrests on the Hill so far over the night and weekend, about some of her reasons for having a visible presence on the streets as the police chief and about observations made while on the ground in the neighborhood. She also talked more about the short and long term strategies to reduce crime in the area discussed at the Friday meeting at the East Precinct Headquarters, and gave tips on how to stay safe while out and about, including some advice based on her time on the force in Boston. Responding to community concerns and analysis from the SPD’s newly implemented Compstat process, Chief Kathleen O’Toole bolstered the number of officers in the Capitol Hill neighborhood this weekend. East Precinct Captain Pierre Davis has assigned officers to walk foot patrols and has put additional officers on bikes on Capitol Hill, with a particular focus on the areas between Broadway and Pike and Cal Anderson Park. SPD’s Criminal Investigations and Special Operations Bureaus are also lending members of the Gang and Traffic Units to add to the ranks of uniformed officers in the neighborhood, another result of the increased communication and cooperation among SPD’s resources fostered by Compstat. This strategic deployment is already yielding dividends. Chief O’Toole and other top brass of the department have been on patrol in Capitol Hill over the weekend. Just last night, Assistant Chief Nick Metz and Captain Ron Rasmussen were on patrol in the 1000 block of E Pike Street when they arrested a juvenile male suspect for threatening to kill a security guard. Officers arrested this youth in the past for violent crimes. Officers booked the suspect into the Youth Service Center for making death threats. Later that evening, Anti-Crime Team officers were walking a foot beat in the same area when they saw a suspect grab a woman from behind and began rubbing himself against her. The woman kicked back at the suspect, but he refused to stop. The officers saw the assault and quickly intervened. They arrested the suspect for indecent liberties. Officers searched the man and found what they believed to be four stolen cell phones and a stolen credit card associated with a separate criminal investigation. Officers booked this man into King County Jail and will coordinate with Robbery detectives for further investigation. Early Saturday morning, the gang unit made its first arrest of the emphasis patrol after hauling in a suspected phone thief. “We’re listening to the community and using data to drive the way we deploy our officers,” O’Toole is quoted as saying in the SPD report on the weekend’s start of increased patrols. The report did not mention Sunday morning’s incident involving two armed suspects spotted near Seattle U after gunfire was heard in the area. One man was taken into custody near 14th and Spring in the incident. 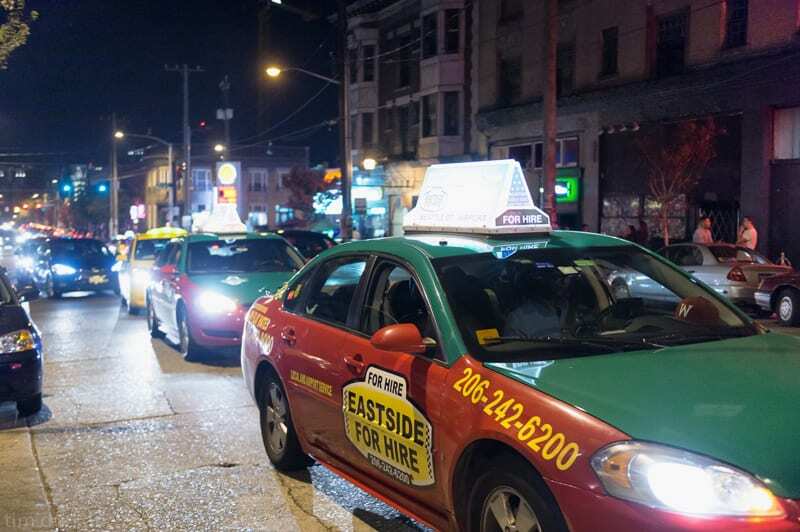 Regardless of its efficacy, the SPD surge is likely a welcome sight to many concerned about the recent spike in late night crime, including vocal local business owners. It may perhaps also be seen as symbol of the what the department under O’Toole wants to communicate about its seriousness around responding to issues in neighborhoods and to concerns voiced by the public. Meanwhile, last week the Stranger argued that the neighborhood safety plans O’Toole is promoting are a flawed approach to fighting crime. O’Toole, Sunday morning, acknowledged that the flood of SPD activity onto the streets of Capitol Hill is a short-term burst designed to quickly help a problem area. 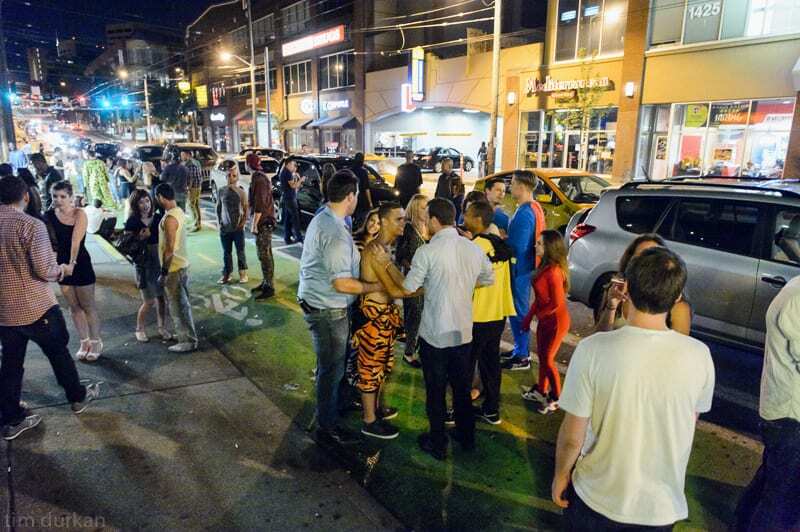 On the street, O’Toole was occasionally dismayed by the behavior of Pike/Pine revelers. “Some of the kids who are harassing people, they’re just so bold,” she said. Here are portions of the rest of the conversation CHS had with O’Toole as the first weekend of increased patrols played out Sunday morning. What can you say about your presence out here tonight? What impact does your personal presence have being out here? I think it’s really important — I’ve never managed from behind a desk. I think you really have to get out and meet people. I think it helps build communication and trust. And I think it’s good for the cops to see me out here too. It shows that I’m getting a first-hand perspective on what they’re facing. So yeah, I think it’s good all around. It’s just the way I’ve always done business. Yeah. I actually live downtown. … I’m involved down there a lot, both during the day and at night. I try purposely to walk around a lot. Based on your experiences and expectations [about the issues in Capitol Hill] — being out here tonight, how do you feel about it? I obviously see some of the concerns that people expressed to me the other day and so it confirms some of the concerns they have. And I’m really pleased to see that the officers … have stepped-up presence. The captain in the precinct has stepped-up presence. We brought in the gang unit and other city-wide resources as well. And so that’s what we need to do. We need to harness resources in a city like this. And the thing that’s really heartening to me in this city is that the community really steps up. The community’s really engaged. I can’t tell you how many people I met at the meeting the other day are out walking around tonight too. So that’s what we need, it really is a team effort. And they’re willing to come to us, and point people out, and share very valuable information with us. So — it’ll work. And he said, ‘Because you look like a cop in plain clothes. You’re making eye contact with everybody. You’re very aware of your surroundings.’ He said, ‘You just don’t look vulnerable enough.’ So I had to start doing this totally vulnerable personality, and boom, boom, boom, they came right after me. What advice would you have for folks to be cautious while out and about? If you can, avoid being alone — travel in pairs at least. And just be really attentive of your surroundings. Because we saw that a large percentage of the people who are victimized here are vulnerable because they’ve had some drinks, or — whatever — having some fun. Just be really, really attentive. Are there are any groups, individuals or actions that are exemplifying the community involvement you mentioned in a positive way? I think at the meeting we had the other day we had, what, a hundred people? … They told us the locations. They showed us the descriptions. They told us they’d meet us out here and show us around. And so it’s really helpful. Is that the kind of activity you’d encourage people to continue? Absolutely. As I said, the only way it works is that we team up. It’s a force multiplier for us. Do you have some idea right now of what particular target areas for the department to address might be? If it’s people getting out late night, or gang activity? I think it’s these street robberies — cell phones, wallets — and I think there are gangs of young people who are … taking advantage in particular of the more vulnerable folks. Are there any lessons from Boston you can see potentially putting in to place here? I think in Boston there are very strong links to the community to and it’s a real city of neighborhoods. And I think that’s when of the really special things about Seattle is that it’s a big city but a small town at the same time. Do you think increasing the number of officers on the street in Seattle is a potential option? Well, we’re trying. Right now we’re looking at where all the bodies are in the organization to figure out how to redeploy some to certain areas that are experiencing the biggest challenges. This entry was posted in Crime, News, etc. and tagged pike pine by Jacob Olson. Bookmark the permalink. A rowdy patron at Lost Lake triggers an “SPD surge”. Meanwhile, the 38 (to date) shootings in the south end, involving 60+ victims causes hardly a ripple. Yup – there are two Seattles. Im not sure where you are getting your information. The issue at Lost Lake was not just a “rowdy patron” and the fact is that murders happen in other places too. I don’t think you are correct with your 60 + murder victims. But assuming it’s true, they are probably not related and probably not in such a highly concentrated 6 block area like the recent issues in the Pike/Pine. For the most part, I would feel safer late at night in Comunbia City than I would up here. This isn’t an issue of “poor South Seattle”. The cops actually spend more hours down there, with less population, than they do up here, with higher contraptions of people and crime. Kerri, please tell us where you got the statistics you quote. Over what period of time did these incidents happen? Typical start to a typical weekend south of I-90. You seem to be confused between the fact that a lot of crime happens down there and police response. In fact, a whole bunch of cops responded right away. Cops can’t proactively prevent people from crime. This wasn’t a situation where more police would’ve made a difference. In a dense area with visible crime being predictable and constant, police presence makes a difference. when I moved to Seattle in the 1990s there were a couple beat cops that used to walk Broadway. I felt a hell of a lot safer walking around in those days than I do now, that’s for sure. I applaud the foot patrol and hope it’s not just a passing gimmick to try and shut us up. Yes! I’m happy about the assertive if belated response to the epidemic of casual street crime on the Hill, but the important thing is that it continues beyond a few weekends. Not to mention that it gets dark earlier. Nice to hear what O’Toole has to say. The problem is it’s in direct opposition to how the people working for her have behaved over the last decade. Changing how the police do their jobs in Seattle will mean getting rid of most of the Captains and Assistant Chiefs she has working for her and replacing them with people who share her vision. We’ll see if she can do that. If not, this will just be more empty promises like we’ve heard in the past. Getting rid of them is one option, though more difficult. The other option is to provide stronger oversight, ask them to buy into the mission and hold them to a higher standard of accountability than ever before. You are right about the pre-O’Toole SPD culture being a more visceral part of the issue. About a month ago I saw her list of command changes on the blotter– I think she reorganized positions/roles in an effort to begin the process of mediating those in charge who enable (encourage?) poor behavior. So interesting to be living in the city while these changes are taking place. I did the same walk through the entertainment district this past Sunday am. 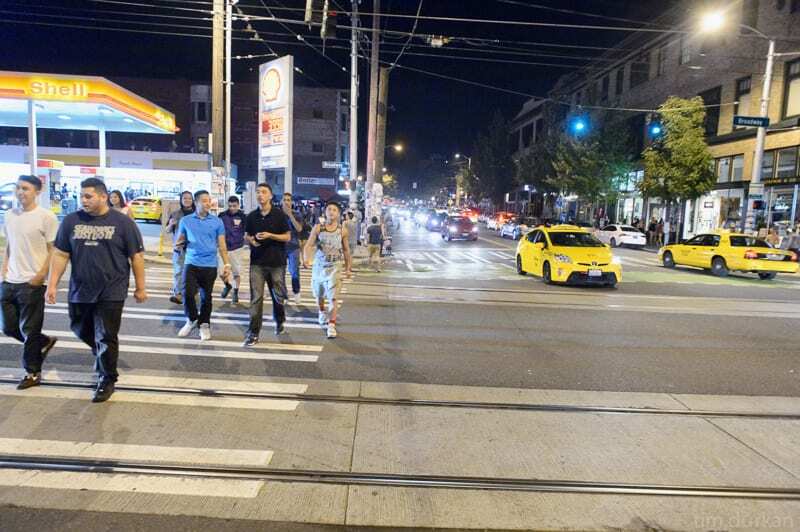 There were far less partygoers on the streets than in weeks/months past. I was unsure if the party crowd was still hungover from Thursday’s Seahawks win or police scared those who would normally stand and chat on the sidewalks away.